Fullback James O'Connor and blindside flanker Dean Mumm have been called into the Wallabies' starting line-up for Saturday's clash with Italy in Canberra. O'Connor comes in for Adam Ashley-Cooper and Mumm replaces the injured Matt Hodgson in the two changes to the starting XV from that which saw off the Barbarians 55-7 at the Sydney Football Stadium last weekend. Both O'Connor and Mumm appeared as replacements during last weekend's international season opener. 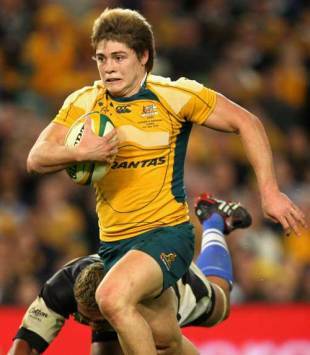 The 18-year-old O'Connor, who will be starting in a Test match for the first time, last year became the second youngest ever Test Wallaby when he made his debut off the bench at fullback during Australia's 30-20 win over Italy at Padova. Ashley-Cooper takes over the position vacated by O'Connor amongst the replacements, while Brumbies utility forward Peter Kimlin has been promoted into the matchday 22. The 23-year-old will be making his Test debut if called on to take part from the bench. While Kimlin was a member of last year's Spring Tour squad, his only involvement came in the non-cap match against the Barbarians at London's Wembley Stadium. Wallabies coach Robbie Deans says the change in the back row was forced by injury, with both last week's debutant, Matt Hodgson (AC joint in his shoulder), and returning squad member Rocky Elsom (bruised knee) ruled out. Deans confirmed Hodgson is unlikely to be available for selection prior to the start of the Tri-Nations, while Elsom will be sidelined for a still to be determined period in order to allow his injured knee to settle. "It's unfortunate for both Matt and Rocky, but we'll give them all of the time that they need to come right," Deans said. "In Rocky's case, his is an injury that has developed over time and he has been playing on it for a while which probably hasn't helped. Mentally Rocky has returned to Australia good to go, but examinations have shown that the damage, in terms of the bruising in behind his right knee, was a little bit worse than was first thought. Because of that, we now need to unload the knee and give it sufficient time to settle down." Deans said there was no specific time-line on when Elsom would be available, although he did concede that the 26-year-old might not be in a position to add to the 40 Test caps that he has earned to date until the start of the Tri-Nations. Italy arrived in Australia last week to begin its preparations for the two-Test series and Deans is advising against under-estimating the visitors. "They showed last year in Padova, where they came within 10 minutes of beating us, what they are capable of," Deans said. "The Italians will have brought the belief from that performance with them, and will be looking to add to it. Far from being daunted, they will be excited by the opportunity that is ahead of them. That will make them a dangerous opponent." Deans noted the return to the pre-ELV laws relating to the rolling maul, where defending teams are no longer allowed to pull the maul down, would assist the Italians. "They are a physical side so the change to that aspect of the game will suit their playing style," he said. "While the set pieces loosened up at times last weekend, which was to be expected in a Barbarians-style contest; this week we are in for a stern examination in those areas - we've no doubts about that!" Australia: James O'Connor; Lachie Turner, Stirling Mortlock (c), Berrick Barnes, Drew Mitchell; Matt Giteau, Luke Burgess; Richard Brown, George Smith, Deam Mumm, Nathan Sharpe, James Horwill, Al Baxter, Stephen Moore, Benn Robinson.